The following documentation provides instructions for installing Grid Control OMS residing on a Sun Solaris 10 (Version 5.10) operating system using an existing database for a repository and conforming to Oracle OFA standards. There is only ONE database installed on the server and that database is at version 10.2.0.4 with ALL recommended patches applied. 2. Ensure nobody account exists. 3. Download the Oracle Grid Control OMS 10.2.0.1 binaries from Oracle into /u01/app/oracle/SOFTWARE/GRID/OMS. 4. Download the Oracle Grid Control OMS 10.2.0.4 upgrade binaries from Oracle into /u01/app/oracle/SOFTWARE/GRID/Upgarde. 5. Download the recommended patches for Oracle Grid Control OMS 10.2.0.4 into /u01/app/oracle/SOFTWARE/GRID/Patches. At the time of producing this guide the following patches were recommended. 6. Download the post installation patches for the OMS 10.2.0.4 patchset into /u01/app/oracle/SOFTWARE/GRID/Patches. At the time of producing this guide the following patches were recommended. 7. Download the iAS 10.1.2.3 upgrade binaries into /u01/app/oracle/SOFTWARE/GRID/IAS_Upgrade. 8. Download the iAS recommended patches for iAS 10.1.2.3 into /u01/app/oracle/SOFTWARE/GRID/IAS_Patches. At the time of producing this guide the following patches were recommended. NB This is a patch if using the in built 10.1.0.4 database. NB This is a patch if using the in built 10.1.0.5 database. NB This is required for the OMS Agent patching. 12. Unzip the post installation patches for the OMS 10.2.0.4 patchset. NB This is required for the OMS Agent patching and fixes Health Check issues. NB This is required for the OMS Agent patching and fixes DMS Schema issues. NB This is required for the OMS Agent patching and fixes Memory issues. 15. Create dbmspool procedure on the database and grant privileges. 16. Run the OMS installer for the base OMS binaries. 17. Follow the instructions in the Example OMS Install section below. 18. If you have patch 5191377 on your database you need to remove it before continuing. Check using the following commands. If the above step returns any output, refer to patch 5191377 regarding its removal. 21. Stop all the application server components, such as Oracle HTTP Server, <nop>OracleAS Web Cache. 23. Run the OMS installer for the Upgrade OMS binaries. 24. Follow the instructions in the Example OMS Upgrade section below. 25. 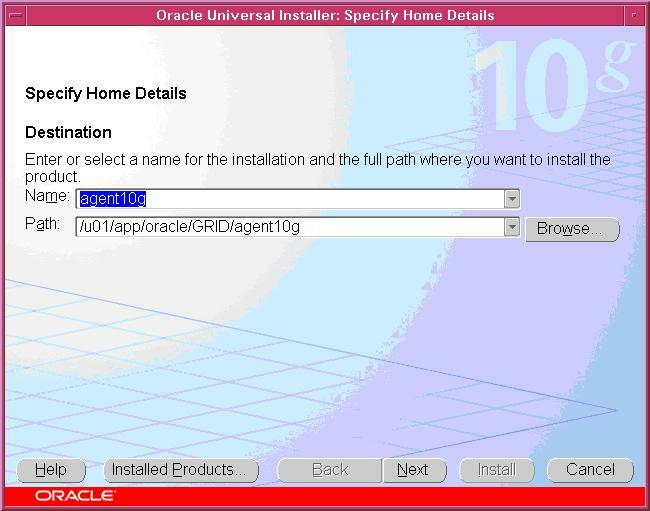 Run the Agent10g installer for the Upgrade Agent10g binaries. 25. Follow the instructions in the Example Agent10g Upgrade Install section below. 28. Stop all the application server components, such as Oracle HTTP Server, OracleAS Web Cache. 30. Apply the post installation patches for the OMS 10.2.0.4 patchset. N.B. This will produce the following error. N.B. This time the patch should apply error free. 32. Identify Solaris Agents with Host 3.0 metadata in the Enterprise Manager repository. N.B. All of the above scripts should return an empty list or 0 rows. If not, refer to the Post Installation Tasks Specific to Solaris Agent Hosts in the readme.html file of the 10.2.0.4 OMS patchset. DO NOT continue until all of the above scripts return 0 rows or an empty list. 33. Start the Grid Control Console and agent on all OMS nodes. Log on to Grid Control console with credentials/privileges that help you edit the host thresholds. Go to the home page for the given host and click Log File Alerts. Click Clear Every Open Alert. To purge the clear alerts, click Show Cleared Alerts and then Purge Every Alert. N.B. This should now produce an empty list. 35. Shutdown the Grid Control Console and agent on all OMS nodes. 37. Start the Grid Control Console and agent on all OMS nodes. 38. Verify that the patch has been applied properly. Log on to Grid Control console. Go to the home page of a UNIX host and click Metric and Policy Settings. 1. Shutdown the Grid Control Console and agent on all OMS nodes. 2. Apply recommended patch 6356310. 3. Apply recommended patch 6614013. 4. Apply recommended patch 6646817. 5. Apply recommended patch 6895374. N.B. Make a note of the broken jobs. N.B. Make a note of the invalid objects. N.B. Make a note of the job queue processes value. N.B. Make sure this returns 0 rows. Do not continue if it does not, instead stop the jobs or wait for the jobs to complete. N.B. Set this back to the value noted in the step above. N.B. Make sure this value is the same as the value noted in the step above. 6. Now apply the January 2009 CPU patches 7609761. N.B. The parameters on this opatch command will check your system for conflicts. If conflicts exist, click 'N' to continue and raise an SR.
7. Now apply Post Implementation Patch 7031906. 9. Now apply Post Implementation Patch 7012242. 1. Set the *DBSNMP* password. Click on the configure database link. In the Configure Database Instance: Properties page, set the DBSNMP password. Once the connection is successful, click *next* followed by *submit*. 2. Delete the Microsoft Operations Manager target. Click on the Targets tab in the Grid Control Console. Ensure you have selected the correct target and click yes to confirm removal. Make a backup of the following files. 2. Start the database and listener. 3. Run the iAS installer for the base iAS upgrade binaries. 4. 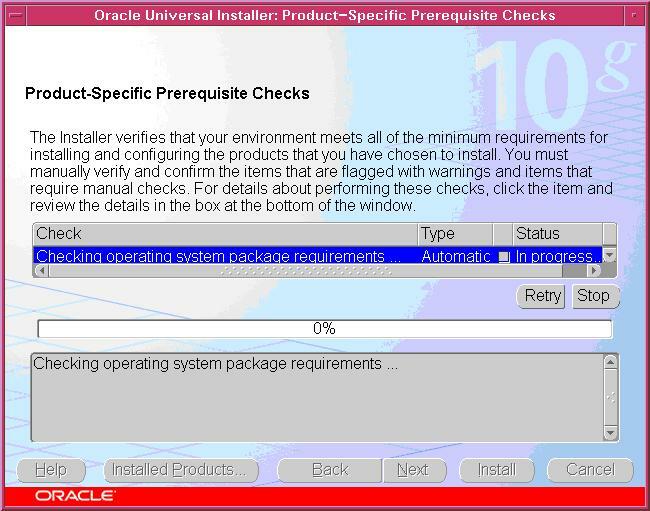 Follow the instructions in the [[OracleGridControlOMSInstallGuide#toc12][Example iAS Upgrade]] section below. Select Enterprise Manager 10g Grid Control Using an Existing Database. Ensure all Operating System Requirements are met. Ensure Require Secure Communications is ticked. This page moves on automatically to the agent10g install page. This page moves on automatically. If the Configuration Assistants are successful, then this page will move on automatically. Ensure all Operating System Checks complete ok. Enter a valid account in the Metalink Account Username field. Select United Kingdom on the drop down box for Country Code. This page will move on automatically. Enter a valid email account in the Metalink Account Username field. Ensure Oracle Application Server and Developer Suite 10g Rel 2 Software Update is selected. Enter the ias_admin Password as specified during the Grid Control install. This page will move on automatically if successful. Ensure all Configuration Assistants complete successfully. When applying patch 7608330 the following error is generated at the end. OPatch found that the following patches are not required. This is due to patch 4601861 being rolled back as it is no longer required. This error is expected and can be ignored. When applying patch 5588438 you may get the following error. This error is caused by an Oracle coding error where it expects a directory to exist and fails when it does not exist. In actual fact, it is unlikely that the directory will exist as it is being created by this patch. 1. Answer N to the question Okay to continue? 2. Rerun the opatch apply command. When applying script jobs_engine_pkgbody.sql for patch 6895374 you may get the following errors. This error is caused by using the '?' in sqlplus to substitute the ORACLE_HOME and the ORACLE_HOME is set to the database home. Ensure the full path to the script is specified. This script resides in the oms10g home directory. 1. Run the script using the full path to the script. E.g. When running allroots.sh you may get the following error. The following error messages may be reported when starting grid control. [JobWorker 875:Thread-19] ERROR jobs.pingCfmEMDDown executeCommand.311 - pingCfmEMDDown: Throwable caught null emoms.log 307734.1 If found during the start up of Grid Control, this message is due to the Agent being down. DEBUG, INFO and WARN messages in emagent.trc log emagent.trc SR Raised and Resolved According to Oracle Support ANY DEBUG , INFO and WARN messages can be ignored!! However, careful attention should be applied to the messages and SR's raised for issues that look dubious. ERROR No appenders could be found for category (oracle.sysman.eml.app.ContextInitializer) em.nohup.log SR Raised and Resolved Only an issue when using iasconsole. This is generally not required for Grid Control. Close down iasconsole when not in use. No fix available. See this log file for error messages emagent.trc emagent.trc SR Raised and Resolved Unknown. Feature/Bug. Oracle non comital. No fix available. 2009-05-26 16:37:27,363 Thread-1 ERROR main: nmectla_agentctl: Error connecting to https://hostname:3872/emd/main/. Returning status code 1 emdctl.trc SR Raised and Resolved Feature! !